A nucleus in beta decay is transformed from one quantum state with a well defined energy to another quantum state also with a well defined energy. However, beta particles emitted in this process have no fixed energy. Why is this happening? The lack of a reasonable explanation of this problem brought into question the validity of the law of conservation of energy. In the 1920s the problem became urgent. In 1930, Wolfgang Pauli half jokingly suggested an introduction of a new being to physics – a neutrino. In the absence of better suggestions, this one was accepted by acclamation. As it appears from the main elaboration, all atoms collide and a result of these collisions is energy quanta produced by electrons. The quanta are emitted to the outside as a thermal radiation. The spectrum of thermal radiation of any body is a continuous spectrum and it corresponds to the curve of a black body radiation. An example of such a curve is shown in Figure 1. – when shields made of ordinary atoms are bombarded with unnatural particles (missiles) of a powerful energy (artificial radioactivity). After a collision of unnaturally heavy atoms or after bombarding atoms with particles of a powerful energy, their electrons experience unnaturally strong vibrations and apart from the quanta of infrared, they produce unnaturally strong quanta (quanta of gamma radiation or quanta of X-rays). The spectrum of this radiation will also be continuous, as presented by the curve in Figure 1. Some of the gamma quanta produced by atoms have the appropriate power to enable the process of pair production. After a collision of these quanta with the nucleus of an atom or electron, electron-positron pairs are created. Then two phenomena can occur randomly. The electron from the above pair neutralizes the proton; an electric dipole called a neutron is formed. The positron unpaired after the process of pair production has to leave the atom. Thus, beta plus radiation originates. The positron from the above pair annihilates the electron which is an element of an electric dipole of the neutron. The neutron without an electron is no longer an electric dipole, it becomes a proton. The electron unpaired after the process of annihilation has to leave the atom. Thus, beta minus radiation originates. 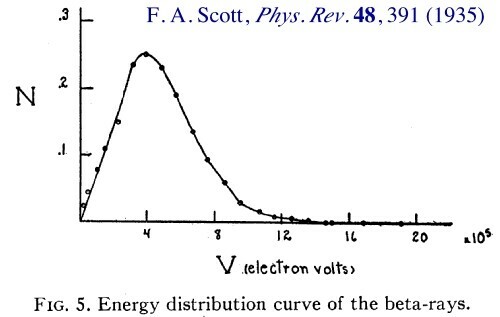 If atoms produce a continuous spectrum of gamma radiation, then electrons and positrons created in the process of the creation of pairs will have the energy proportional to the power of quanta they were created from, thus their spectrum of radiation should also be continuous, as shown by the curve below. The curves in Figures 1 and 2 were determined experimentally. As it is shown in Figure 3, the similarity between them is striking. The above can be summarized in two sentences. After unnaturally strong collisions of atoms, their electrons experience unnaturally strong vibrations and they produce unnaturally strong quanta of X-rays and quanta of gamma radiation. In the process of the creation of pairs, the gamma quanta of appropriate energy turn into electrons and positrons whose spectrum of energy is continuous, just like continuous was the radiation spectrum of the quanta they were created from. With such an approach to the problem, while explaining the mystery of beta radiation, we no longer have to make use of the ad hoc created particle called a neutrino. A neutrino was brought to life only because there was no knowledge of the existence of the subatomic world of energy quanta and the subatomic world of dark energy. Moreover, such an interpretation of beta decay allows a proton to maintain the status of a particle which does not undergo a decay under any circumstances. The current interpretation makes an exception and admits a decay of a proton in the beta plus process, although an explanation of this phenomenon requires linguistic acrobatics and mathematical jugglery.